The august and esteemed personality of the Islamic world, the heir of the knowledge of Imam Ahmad Rida Khan, Taajush Shari'ah, Shaykh al-Islam Shaykh Mufti Muhammad Akhtar Rida Khan al-Qadri al-Azhari arrived in Syria on Friday the 22nd of August 2008. Syria being the centre of the supplications from the Beloved Messenger (Sallal Laahu Alayhi Wasallam), has been, is still, and shall still remain a place where the anwaar and barakaat continuously emanate from. "Blessings to al-Shâm, blessings to al-Shâm, blessings to al-Shâm!" (yâ tûbâ li al-Shâm). They asked why and he replied: "Because the wings of the angels of the Merciful are lowered over it." According to Syrian local time, Hudur Taajush Shari'ah arrived at the Syrian international airport at approximately 9:30 a.m. exiting through the specific gates with his august personality accompanied with a few of his devotees. He was welcomed warmly by many well-wishers of the Shaykh who has arrived at the airport. From the airport, Hudur Taajush Shari'ah was then taken to the Wulat al-Umara on Shari' at-Tayran, where the Shaykh stayed for 4 days. On the first day, in honour of the 'Ulema and Masha’ikh of Syria, there was a feast held in which many great 'Ulema and Masha’ikh were invited. There was such a great number of 'Ulema on this occasion, that such a high number of 'Ulema being gathered in one congregation is hardly found in anywhere in Damascus. The gathering was commenced with the recitation of the Holy Qur'an, after which poems were sung in praise of the Beloved Messenger. 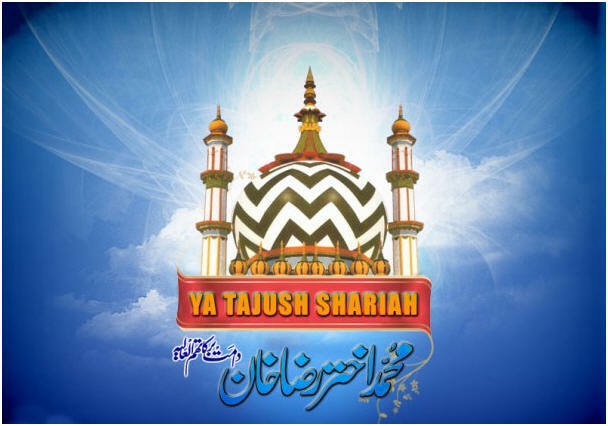 Despite his ill health, Hudur Taajush Shari'ah delivered an extraordinary speech in eloquent Arabic, by which all the 'Ulema were moved and touched. Upon the request of the 'Ulema, Hudur Taajush Shari'ah recited in his own voice, his Qasida in Arabic, whose first lyrics are: Allah Allah Allah Hu Ma li Rabbun Illa Hu, in a very beautiful and heart-enlightening manner, by which the whole atmosphere was enlightened. There was hardly anyone from the 'Ulema who was not moved by this Qasida and who did not join in reciting it joyfully. The scholars also sought Hudur Taajush Shari'ah's verdict on many issues, whereas some others sought Sanad al-Ijazah in Hadith-narration from the Shaykh. Shaykh 'Abd al-Jalil 'Ata also presented and read a poem which he had compiled in praise of Hudur Taajush Shari'ah. On Sunday the 24th of August, a gathering was held in honour of Hudur Taajush Shari'ah by the son of the ex-Mufti of Syria and the head of the Ma'had Abun Noor Shaykh Salah ad-Din Kuftaro, and the committee and the 'Ulema of Jami' Abun Noor. Hudur Taajush Shari'ah delivered a very concise lecture on the topic of Tasawwuf, Sacred Knowledge, and the pristine teachings of the Ahlus Sunnah and its truth. Afterwards, upon the request of the 'Ulema, Hudur Taajush Shari'ah also recited his Qasida in Arabic, stating points of tasawwuf in the midst of this. Two renowned mudarrisin from the famous Madrasah in Aleppo (Syria) al-Kiltawiyyah, and representatives of Shaykh Mahmud al-Hut, also attended this gathering and met the Shaykh. After the gathering terminated, Hudur Taajush Shari'ah paid visit to the blessed mausoleums of the Knower of Allah, al-Shaykh 'Abd al-Ghani al-Nablusi (Alaihir Rahmah) and also to the blessed mausoleum of the King of the world of Tasawwuf, al-Shaykh al-Akbar Shaykh Muhyi'd Din ibn-e-'Arabi (Alaihir Rahmah), which are also centre points which many visit for blessings. On this very day, a great scholar renowned in the field of Kalam and a scholar who has written many commentaries on different books, Shaykh 'Abd al-Salam 'Abd al-Hadi al-Shannar became a disciple of the Shaykh and entered into the silsilah Spiritual Path of Hudur Taajush Shari'ah. Thereafter, Hadrat Taajush Shari'ah also blessed him with khilafah. On that very day, after the Isha Salaah, a special gathering was conducted specially for the students of the Sacred Knowledge who were residing the studying in Syria. The students gained much benefit from the presence of the Shaykh, as the Shaykh would answer their questions and solve their queries and problems. Many students also swore the oath of allegiance at the blessed hands of the Shaykh and entered into the silsilah. There was a constant influx of people visiting Hudur Taajush Shari'ah on this day, being it the final day of stay for the Shaykh. From amongst the scholars, Shaykh 'Abd al-Hadi al-Kharsa and Shaykh Hasan al-Badinjki were also present. The latter, is a renowned Spiritual Leader of Aleppo and also the head of a religious institution there. Two renowned scholars of 'Iraq Shaykh Qutaibah al-Sa'di and Shaykh Marwan 'Ali Anwar were also blessed to visit the Shaykh on this day. Hudur Taajush Shari'ah made supplications for the whole of the Muslim Ummah in general, and especially for 'Iraq, as per the request of Shaykh Sayyid al-Sabah. It was on this day that a special gathering was held only for the women and sisters, in which many questions were asked by them, which Hudur Taajush Shari'ah thoroughly answered. Many sisters also entered into the silsilah of Hudur Taajush Shari'ah. On the 26th of August, as per the request of the 'Ulema Hudur Taajush Shari'ah was presented with many Asnad al-Hadith which he signed personally. Hudur Taajush Shari'ah blessed us immensely with his supplications throughout this whole journey. A huge group of Pakistani students accompanied Hudur Taajush Shari'ah to the airport to bid farewell, whilst in the midst of all this, the Shaykh would bless them with his supplications and sincere du'as till Hudur Taajush Shari'ah went inside the airport. 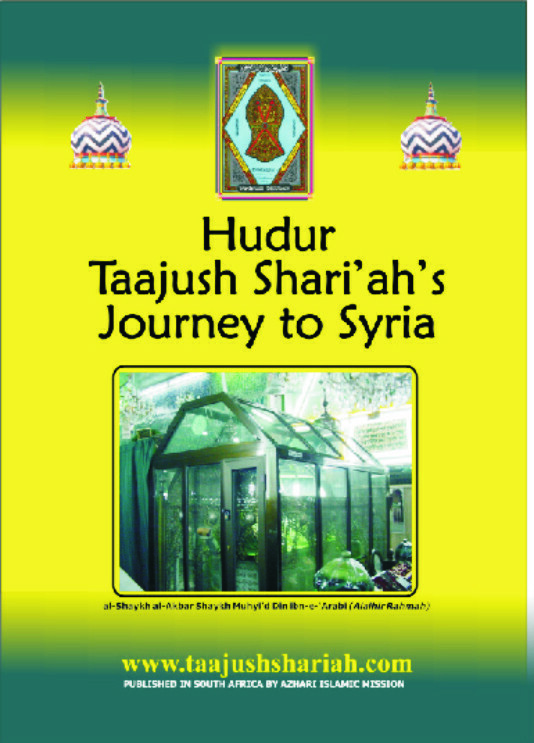 Hudur Taajush Shari'ah's visit to Syria was not only a great blessing, but it was also extremely beneficial for the propagation of the deen. However, we and many more others, were left sorrowful after his departure. May He also grant immense reward to al-Haj Khalid al-Hindi and bro. Tariq who were intermediaries for this great blessing Hudur Taajush Shari'ah’s arrival in Syria.